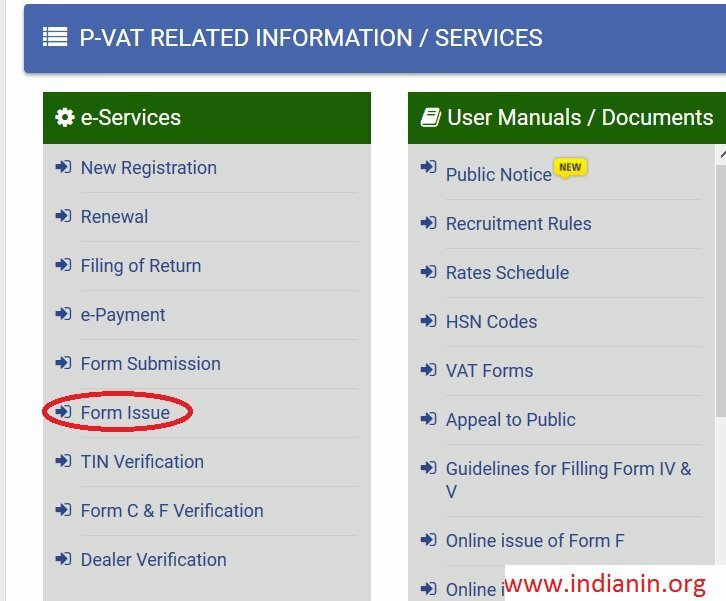 Go to P VAT tab available in the home page. Click Form Issue link under e-Services tab. 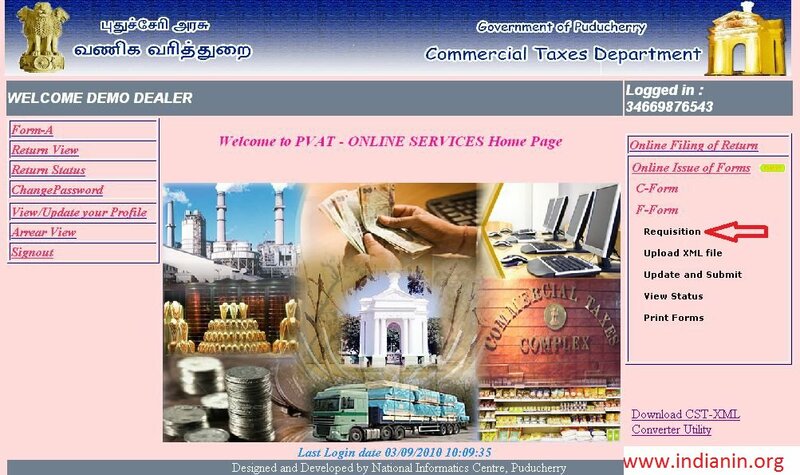 You will be redirecting to the website of the Commercial Taxes Department, UT of Puducherry. Login using all the credentials required. 3. The account will get deactivated after Seven unsuccessful attempts. 5. Kindly ensure that Java Script Enabled browser is used. 6. For availing hassle free service use of IE 6.0 and above browser is recommended. In the main page various options are displayed. 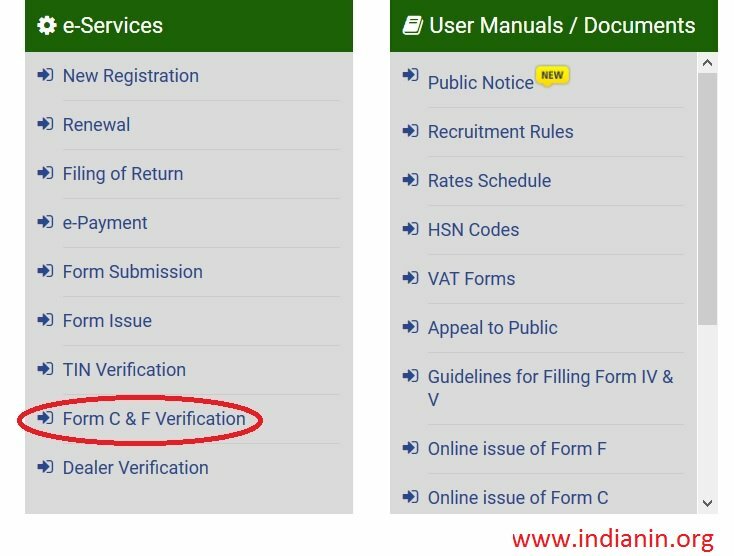 Here, select the ‘F-Form’ option under Online Issue of Forms menu. Now, select the ‘Requisition’ option in F-Form menu under Online Issue of Forms. Now Select the ‘Month’ & ‘Year’ for which F Form is required and press ‘GO’ button. Once the requisition is submitted, it is not possible to make any changes/ corrections/ alterations/ in the form. You will be asked to enter Transferor’s details. 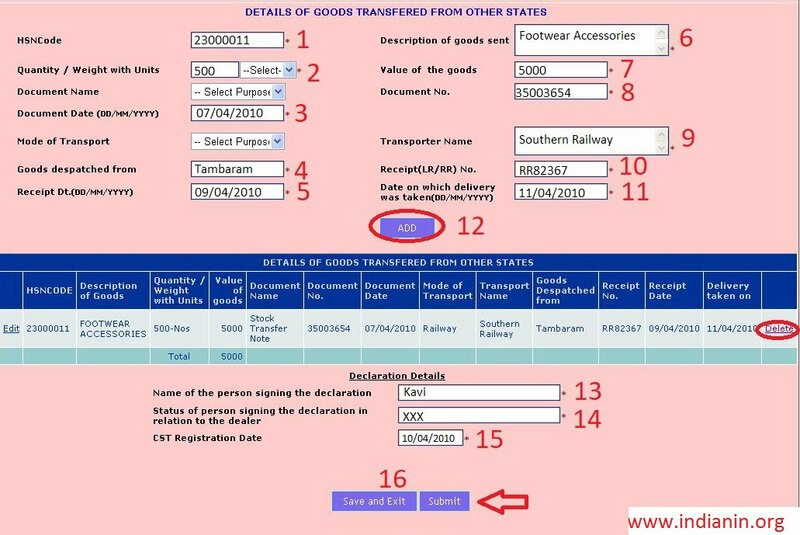 Now enter details of goods transferred from other states for the given month oneby- one. Here, system verifies whether document date falls in the same month. 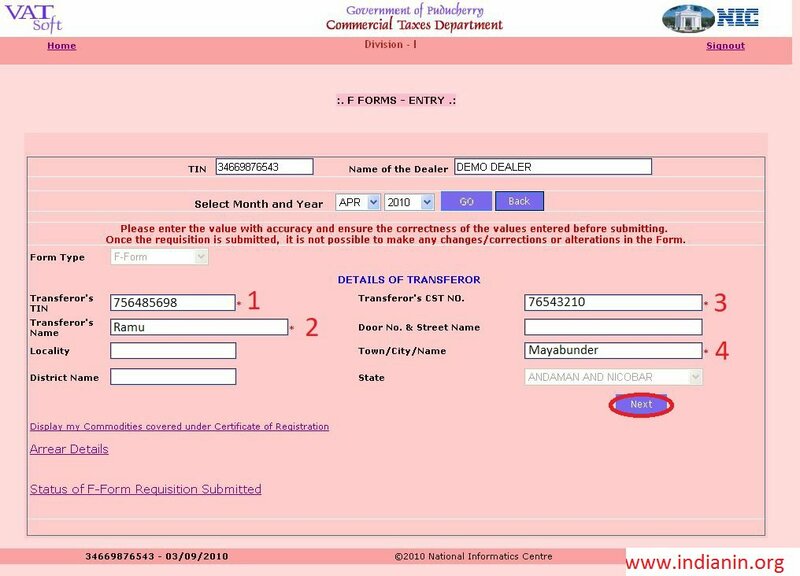 Also system does not allow duplication of entry of document number. You can also delete the details by clicking “delete” button. If you are sure about details entered, you can click submit button directly. 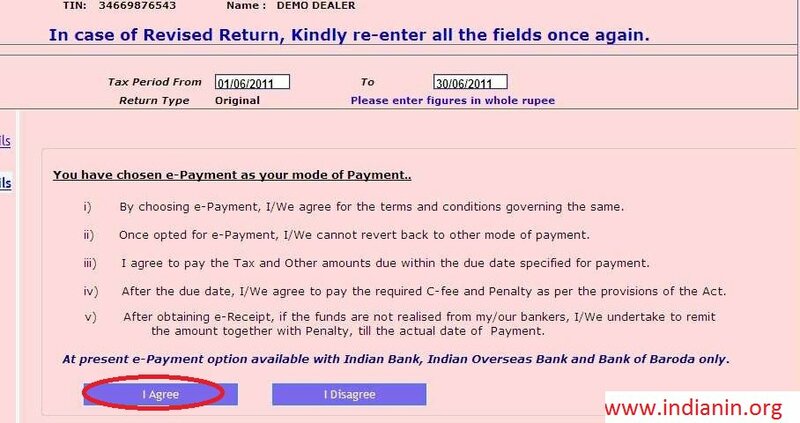 Or else the dealer can click save & exit button, so that he can use update & submit option in F-Form menu. When you click ‘Submit’ button then the following screen will be displayed. User has to read and select yes for all the options. Now, the system instantly shows the acknowledgement for submission. 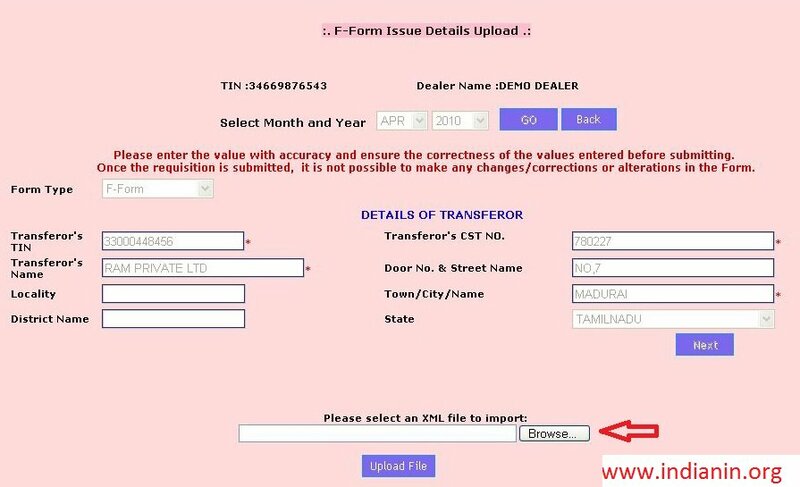 Also the dealer has the option to ‘upload XML file’ containing details of Transferor’s and goods transferred from other states. 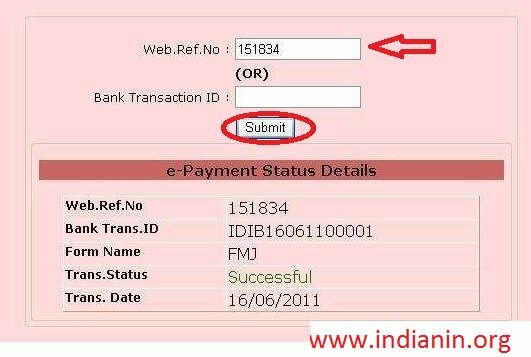 If the Status is Approved, user can take printout of the F-Form by selecting ‘Print Forms’ in the F-Form menu under the online issue of forms. Click on the link Form C & F Verification available in th home page. 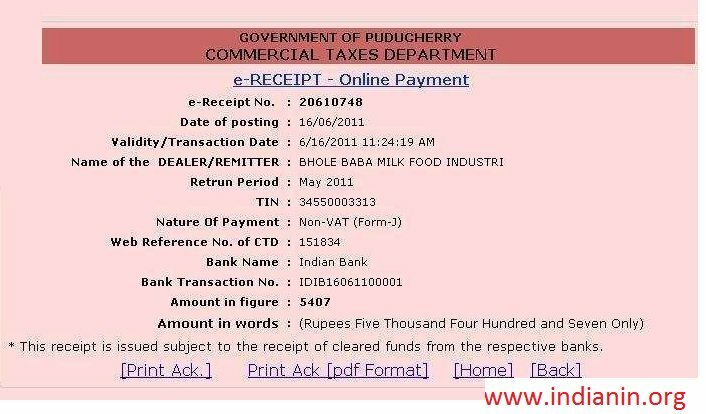 Using this module one can verify the details of the Online TIN and CST forms issued by the Commercial Taxes Department, Puducherry. 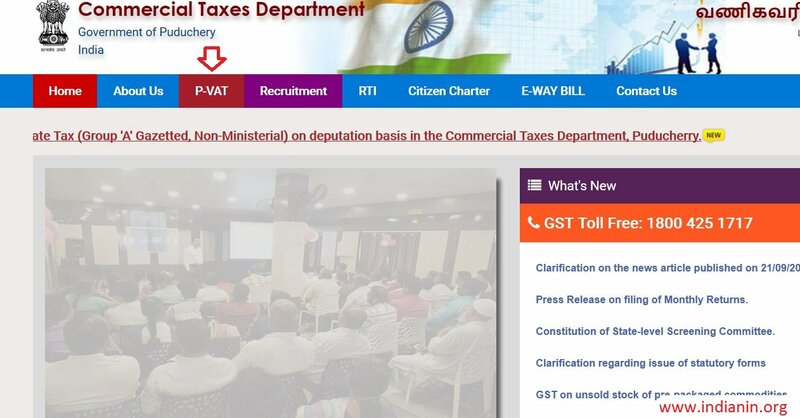 Dealers, who have valid Registration, can apply for the ‘C’ Forms through online by login to the Commercial Taxes Department official web-site. There is no any charges applied for this service. Dealers can obtain ‘C’ Form through this system for the purchases made From 1st April, 2010 and the Forms are issued on Monthly basis. The system of issue of ‘C’ form is fully computerized and there will be no manual interruption. On opening the official website, You can find form issue link available under Online Services tab. 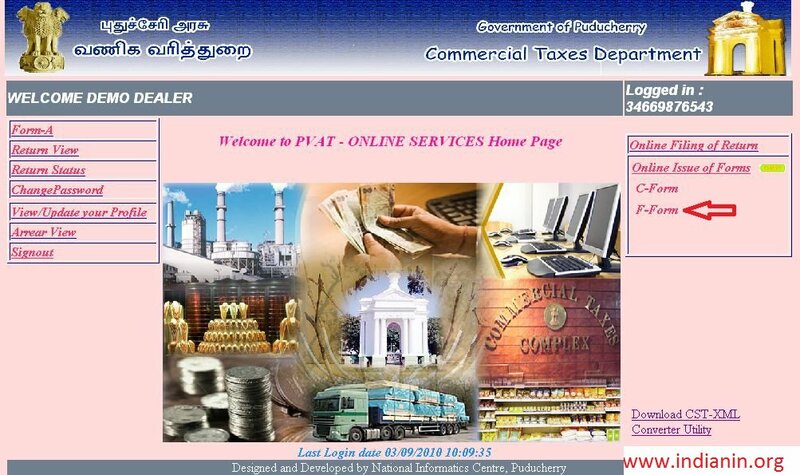 You will be redirecting to the website of the Commercial Taxes Department, UT of Puducherry. Then select the ‘Requisition’ option in Online Issue of Forms menu. In the upcoming screen dealer is required to enter sellers details. Now you are required to add transaction details one-by-one for the chosen month. Please note that system wont allow duplicate invoice entry. Even now the dealer can edit the details like add or delete. After clicking the submit the dealer cannot change any of the details. When you click ‘Submit’ button then the following screen will appear. User has to read and select yes for all the option. Acknowledgement slip will be generated after click on I Agree button. It will take 7 days for the department to complete all the process. In the mean way dealer can check the status of forms to be issued. 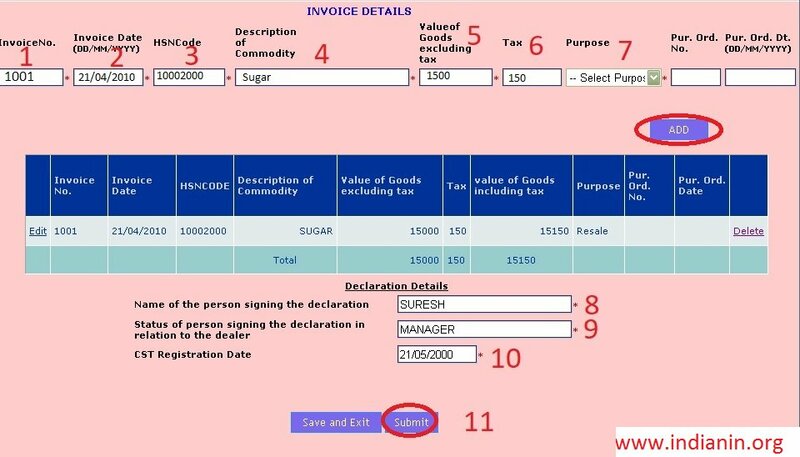 If the Status is shown as approved, then the dealer can take the printout of the C-Form by selecting ‘Print Forms’ in the main menu of the online issue of forms. 1. 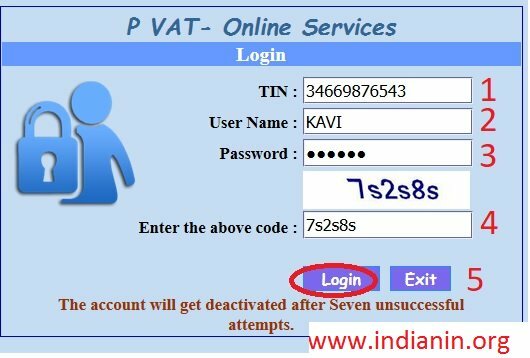 You are required to login with TIN, Username & password for the renewal of VAT/CST Registration. 2. You can find an online renewal link in the home page. 3. It will take you to renewal page and TIN no will be required to proceed further. 5. Then enter the correct PAN No as required. 6. Details as per our office record will be displayed. 7. Then enter your personal communication details like Phone No. or Mobile No. or Fax No. or E-mail I.D. 10. Next, enter number of additional places of business (in numbers). 11. Next, if you are manufacturer put a tick mark against ‘Manufacturer’ and also select the relevant category viz., Micro, Small, Medium, Large and others. 12. Now, enter the SSI/MSI/LSI register No. and date, Date of commencement of production as per the certificate issued by the Directorate of Industries. 13. Next, type the name of the goods manufactured, separated by comma for each goods. 14. Next, if you are trader put a tick mark against it and select a category from Wholesaler / Retailer / Distributor / others. 17. 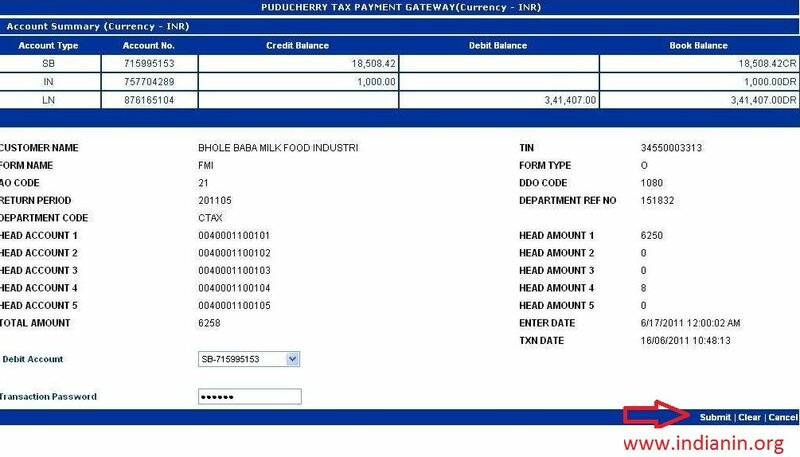 Now you are required to select payment details like DD No, Amount etc. 18. After entering all the values and details, now press the Save button. 19. If you are sure about all your details entered, click submit button to complete your renewal process. Login with your TIN, User Name, password for e-Payment in the P VAT page. Choose the appropriate returns and fill all the columns. In the mode of payment, select e-payment from the drop down list and click Add button. On the First occasion, a new screen as shown below will appear, informing the terms and conditions governing the e-payment. Click on I agree button. ii) Once opted for e-Payment, I/ we cannot revert back to other mode of payment. 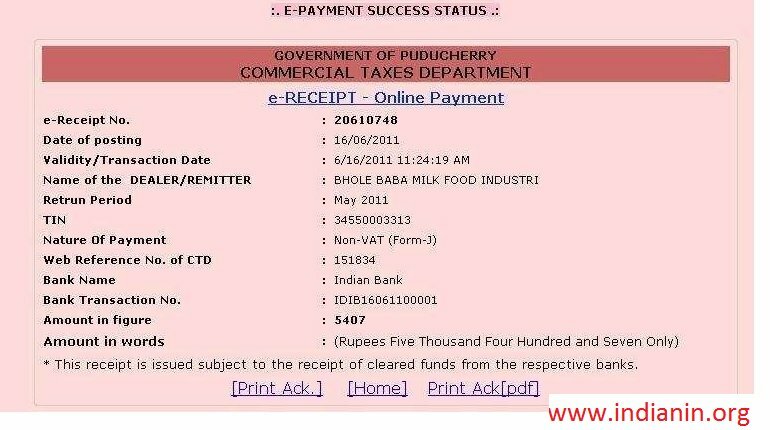 iv) After the due date, I/ we agree to pay the required C-fee and penalty as per the provisions of the act. v) After obtaining e-receipt, if the funds are not realised from my/ our bankers, I/ we undertake to remit the amount together with penalty, till the actual date of payment. At present, e-payment option available with Indian Bank, Indian Overseas Bank & Bank of Baroda only. Then click on e-payment link. After verification of the Web Reference Number, all the required values as entered by you are displayed. Users are requested to verify the details. The dealers are requested to select the bank of their choice where they are having Net Banking facility with valid user ID and Password to transfer the amount to the account of CTD. On clicking the confirmation message, you will be redirected to your selected bank to pay the amount. 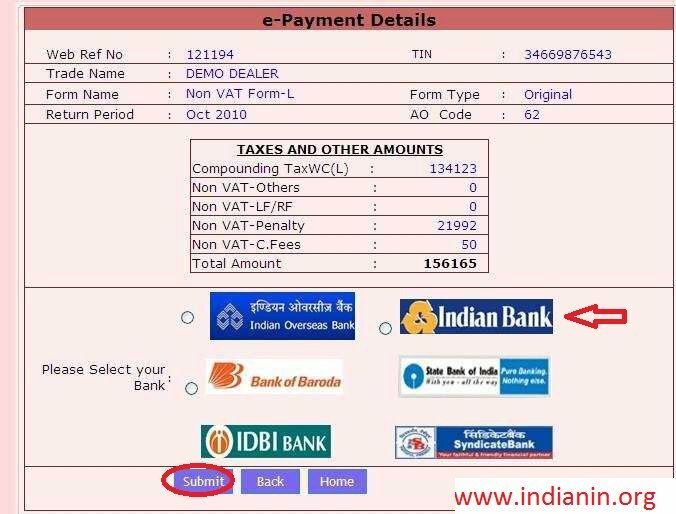 If you select Indian Bank, Indian Bank payment option screen will be opened. Select your choice as single or multiple users. Then login with user name & password to proceed for payment. Sample payment page is shown below. Click on submit button after verifying all details. After confirmation of message you transaction will be done and amount will be debited from your account. Payment Successful Status Page not only confirms the payment but also provide the transaction details along with the Transaction Reference No. 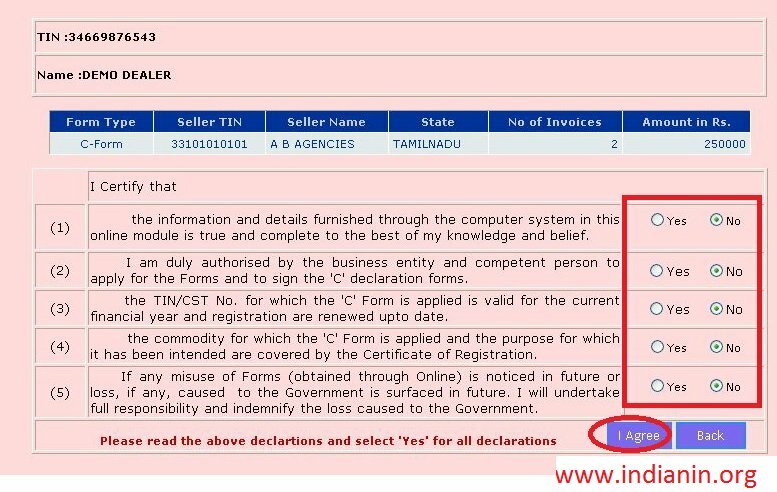 The dealers are requested to note Transaction Reference No. and they have the provision to print the payment details for their future reference. Once the dealer click ok button, the page will be redirected to the Commercial Taxes Department where the dealer started the payment procedure. If the user selects the “Print” option, then the system prints the Transaction details and redirects you to the CTD’s website. 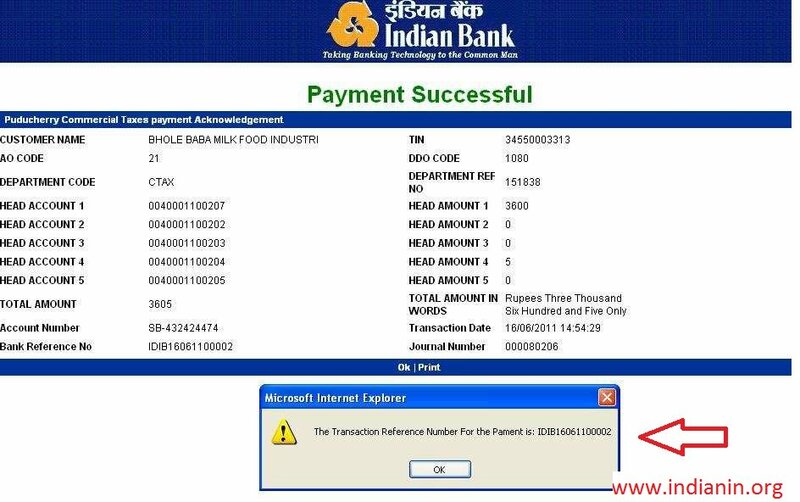 User can check the status of payment using Web Reference Number of Bank Transaction ID. The Status shown as “Payment Pending” at the time of transaction will be changed as Successful after approval by the competent authority. The CTD web site provides a facility to reprint the receipt of the payment made online. It is an option for the dealers to verify their payment status. Immediately after clicking this option, the system interacts with the bank internally and appropriate Current Status Page will be displayed to the dealers. How can I make payment of VAT? You are required to login with your TIN number, user name & password to make an e-payment. I forgot my password and my a/c is locked. What can I do? If you continuously make 7 unsuccessful attempts, your A/C will be locked. Thereafter you have to contact the Assessing Officer for resetting the Username and Password. 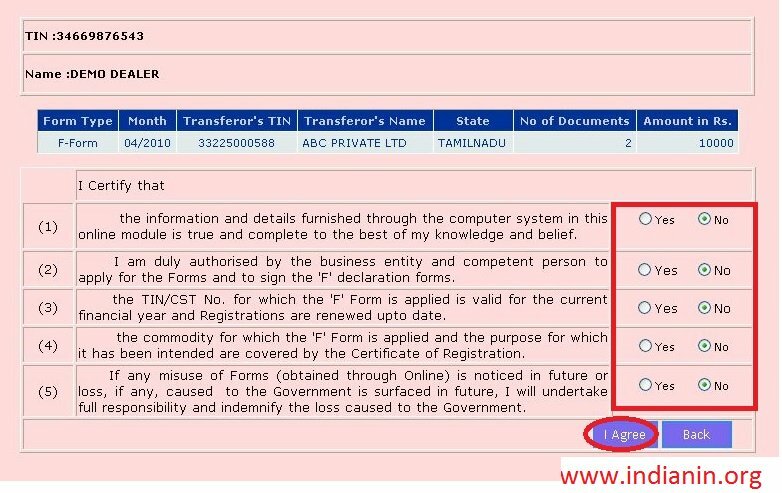 We can’t view the ‘C’ form details of TIN 34820004474 issued for 2016-17 by Fine Automotive & Industrial Radiators Pvt. Ltd.